When an Initial Public Offering (IPO) (or stock market launch) that she’s brokering goes badly wrong, investment banker Naomi Bishop (Gunn) finds herself within touching distance of the glass ceiling. Passed over for promotion because of the launch’s failure, Naomi is further rankled by her boss’s assertion that the deal didn’t work out because she ruffled a few feathers. Given another project to work on – the launch of a privacy company called Cachet – she finds her rapport with the company’s owner, Ed (Roukin), tested early on, and the project is saved from potential disaster by the timely intervention of Naomi’s assistant, Erin Manning (Thomas). Realising what an asset she has, Naomi uses Erin to keep Ed happy. Meanwhile, Naomi’s boyfriend, broker Michael Connor (Purefoy), is in need of an insider tip that he can pass on to old friend and businessman Benji Akers (Bierko). When he learns about Cachet, Michael tries to find out what he can about the company, but Naomi is tight-lipped about it. Later he tries to look around on her phone but her password defeats him. Also at this time, Naomi runs into an old friend, Samantha Ryan (Reiner). What seems to be an unexpected but pleasant reunion is soon revealed to be a ploy on Samantha’s part: she’s part of a government team investigating both Michael and Benji. When Naomi realises this, she refuses to cooperate. As the day of the IPO approaches, Naomi learns that Cachet, far from being the heavily firewalled company that Ed brags it is, is at risk from hackers. This leads to Ed questioning Naomi’s confidence in the IPO, and beginning to have second thoughts about working with her. Erin is told to keep him “sweet”, and she manages to do so, keeping the deal alive. When Erin learns that the person who warned Naomi about the risk of Cachet being hacked has been fired, she tries to get hold of Naomi to tell her. Unable to, she ends up at Michael’s apartment, where she makes a decision that will have far-reaching consequences not just for Naomi, but for Michael, for Samantha, for Cachet, and for Erin herself. 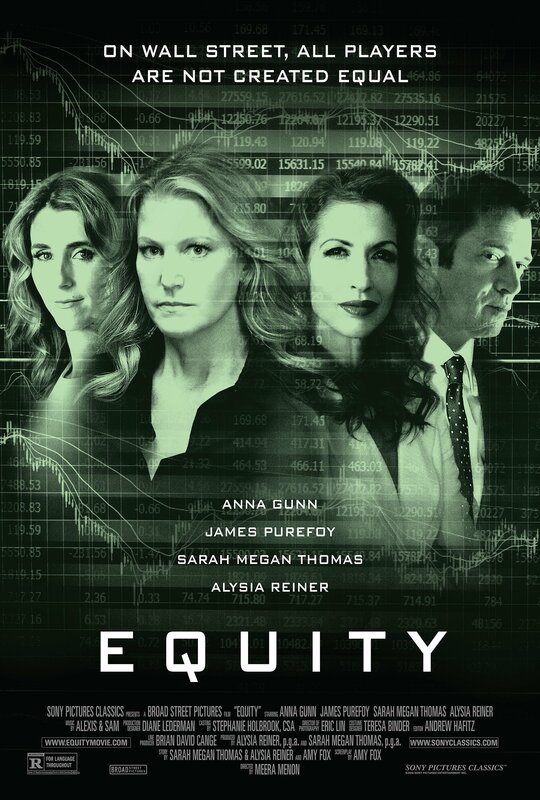 A movie created, developed and assembled by women, and which features women in almost every role you can think of, Equity is a movie that, thanks to its female-centric provenance, comes loaded down with anticipation and a lot to prove. The world of investment banking has a male-dominated heirarchy that makes it difficult for a woman to succeed in the same way that a man does. As Naomi discovers, one mistake, one project that doesn’t go as planned, and the knives are out, with even colleagues adopting a “dead (wo)man walking” approach to their interactions with her. Using this as the backdrop for a tale riddled with deceit, backstabbing and betrayal, the movie attempts to make Naomi the heroine – unfairly treated, a little naïve despite her position and experience, and working within a personal ethical framework that her colleagues don’t seem to share or understand. It’s the age-old question: can a woman succeed in a man’s world? For a movie that sings the praises of female empowerment, and presents us with a trio of female characters, each with their own individual sense of entitlement, Equity can’t seem to make up its mind what to do with them. When we first meet Naomi she’s a strong, charismatic woman who’s close to the top of her profession, but it’s not long before the cracks begin to show and she’s running just to stand still. Similarly, Samantha’s determination to bring a case against Benji and Michael sees her chase down leads using guile and no small amount of ingenuity, but as soon as she gets bogged down and her investigation grinds to a halt, she doesn’t know what to do next. Only Erin seems to have a game plan that works, and where she ends up is perhaps indicative of the answer the movie itself is plumping for: yes, women can succeed in a man’s world, but they have to behave like men in order to do so. Ultimately, Amy Fox’s screenplay – from a story by Fox, Thomas and Reiner – lacks focus and contains some astonishingly lame dialogue, particularly the scene where Samantha “seduces” Benji’s right-hand man, Cory (Corddry) (you will cringe; seriously, you will cringe). There’s also no one in the movie who is even remotely sympathetic, making it difficult to care about anyone, even Naomi, who by the movie’s end should have won over the audience thanks to the predicament she ends up in, but who remains a character you can easily forget about five minutes after the movie’s over. From all this it’s unclear just what message the movie is trying to get across, or even how important it is. Is it asking us to consider whether women should compete with men in the land of IPO’s, or is it that the movie believes women should compete, just as long as they leave their feminine principles at home? Gender issues aside, there are efforts to make this into a thriller, but these aren’t very convincing, as it all boils down to whether or not the knowledge that Cachet is hackable will affect the share price on the first day of trading (it’s that exciting). But as we already know what’s happened up to this point, and the script has conveniently spelled it all out for us, the issue of the share price becomes just another glum moment in an overly glum movie. Thanks to the script, the performances lack depth, and for the most part, any appreciable energy. In the last third, Gunn defaults to a perplexed expression that apparently explains how Naomi is feeling in every scene she’s in, while Reiner falls back on dismay at every opportunity (as well she might). But it’s Thomas who really lets the side down, adopting a wide-eyed, “who me?” approach to Erin that makes her look like she’s either on drugs, or is just a few seconds behind everyone else. As for Purefoy, he could have phoned in his performance and it wouldn’t have looked or sounded any different, such is his obvious boredom in the role. In the director’s chair, Meera Menon does what she can to make the movie look and feel more important than it is, but the material works against her too often for her to make much out of it at all. Scenes come and go with no great acclaim, and the various “twists and turns” can be seen coming from a mile off. The movie also struggles to find its own rhythm, with Andrew Hafitz’ editing making the movie look as if it’s been pared down from a longer cut. There’s the germ of a good idea here, but the execution of it leaves much to be desired, from Erin’s pregnancy which has no bearing on anything, to Samantha’s already discussed “seduction” scene, to Naomi yelling at her boss, “When is it going to be my year?” Sadly for Naomi, and the movie, it’s not 2016. Rating: 5/10 – moderately engaging but increasingly mired in mediocrity overlaid with a bland sensibility that it can’t overcome, Equity isn’t the gender equality triumph its makers were perhaps hoping for; dramatically flaccid for long stretches but still watchable, the movie struggles most with its trio of central female characters, a mistake that the makers appear to have made no effort to curtail, leaving the audience with no one to care about, or root for. 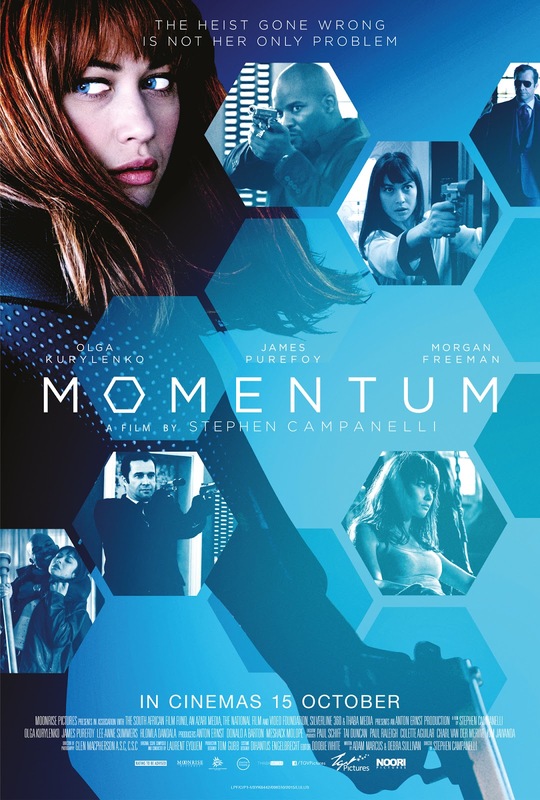 On the face of it, Momentum looks like another generic action movie with its central protagonist on the run from a team of highly skilled assassins who are after something the central protagonist has in their possession. And so it goes: Momentum is exactly that kind of movie. But while it certainly follows a very worn and well-trod path, there’s also enough here to warrant more than a cursory glance or viewing, because even though it could be accused of being derivative and occasionally unappealing, it has an energy and a clear sense of purpose that elevates the material and makes it a more enjoyable experience than expected. It begins with a very odd sight: four bank robbers dressed like extras from a G.I. Joe movie breaking into a vault while bank staff and customers alike cower in fear of being shot by the usual robber with a hair trigger. The robbers steal a fair amount of diamonds and, in amongst them is a flash drive. As they’re about to leave, the robber with a hair trigger gets mouthy with the gang’s leader and winds up dead for his trouble – but not before he’s unmasked the leader who turns out to be a woman. Said woman is Alex (Kurylenko), and she’s been persuaded to take part by co-robber, Kevin (Moss). 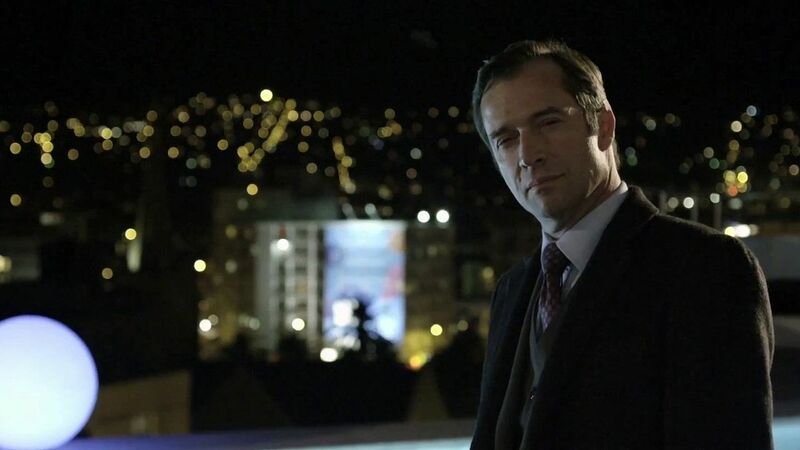 Later, at a hotel, Kevin’s idea of extra insurance re: selling the diamonds leads to the arrival of Mr Washington (Purefoy) and his team of mercenaries, who want the drive. While Alex hides under the bed, Kevin is killed. She manages to escape, and with the drive, but Washington is soon hot on her trail. She makes it to the home of third robber, Ray (Murray). While she’s there, Alex contacts Kevin’s wife, Penny (Summers) to warn her that her life is in danger from Washington and his men but Penny is dismissive thanks to previous animosity between her and Alex. This doesn’t stop Alex from heading for Penny’s home when Washington learns her address. There she takes out two of Washington’s men, and tracks them to their hideout in an abandoned factory. For a while she has the upper hand, but is outsmarted by Washington and captured. Washington begins to torture Alex for the whereabouts of the drive, until he realises that Alex is a lot more than she seems, and changes his approach. This leads to Washington obtaining the drive – or so he believes – at the airport, but Alex has other ideas. It should be noted from the outset that Momentum has plot holes the size of Table Mountain (seen briefly in an aerial shot of Cape Town, where the movie takes place). The biggest and most obvious plot hole concerns the flash drive itself. As the movie’s version of Hitchcock’s favoured McGuffin, the flash drive contains evidence of a plot to destabilise the US by a crooked senator (Freeman). Why it happens to be in a safety deposit box in the vault of a Cape Town bank is a question the movie never gets anywhere near answering. And where Alex gets her incendiary devices from – one pops up out of nowhere – is another mystery you might as well forget about chasing an answer for. This is an action thriller that concentrates on its various action sequences and only occasionally remembers it has a (basic) plot to refer to. But within that framework there’s much to enjoy, from Kurylenko’s tough-as-nails Alex, a woman with a very specific past that, along with the movie’s denouement, is designed to enable further adventures, to Purefoy’s debonair assassin, a winsome, laidback, much needed performance that offsets the rest of the movie’s defiantly grim proceedings. 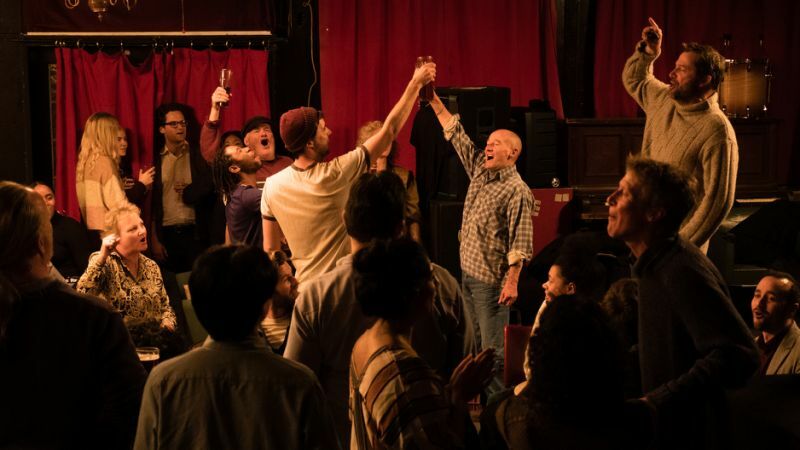 Both actors are well-cast, and the nature of both characters is brought splendidly to the fore, despite the sometimes banal dialogue they have to recite thanks to screenwriters Adam Marcus and Debra Sullivan. As adversaries, they make a good team. There’s also the not-so-small matter of the action sequences, which often belie the movie’s budget, and which are confidently and expertly staged. 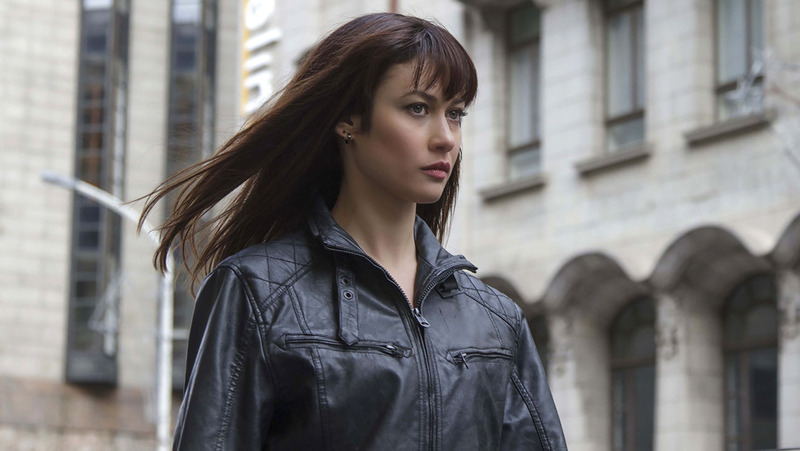 Kurylenko acquits herself well in these scenes, and there’s a sense that the makers were looking for a harder edge than usual, as Alex’s way of dealing with Washington’s team is often uncompromisingly brutal. That said, the movie baulks at putting Alex in too much physical danger, even when Washington has her leg in a vice and is determined to torture the whereabouts of the drive out of her. Elsewhere, the movie’s treatment of its secondary female characters – Penny, Kevin’s insurance policy Jessica – leaves something to be desired, as well as a couple of instances where children are threatened for no other reason than that they can be. There are a couple of twists and turns, and the script takes time out to provide Alex with a back story that explains her particular skill set, but the emphasis is on moving things along as quickly as possible. This does lead to a number of risible moments where convenience is the order of the day, and coincidence rears its head to poor effect, but by and large Momentum concentrates on being a thrill ride, and in that respect it succeeds with aplomb. There isn’t a stand out sequence as such, but taken as a whole, the movie works in a better fashion than expected, its narrative proving a mix of standard action tropes and waspish humour that is enjoyable and mostly rewarding. Campanelli, making his feature debut after a successful career as a camera operator on movies as diverse as The Exorcism of Emily Rose (2005) and J. Edgar (2011), handles the visuals well and finds creative ways of using space, and depth of field, in the action scenes. Wisely, perhaps, he leaves Kurylenko and Purefoy to do their own thing, though Freeman (who shot his scenes over two days) looks uncomfortable trying to create a villain out of nothing. Rating: 6/10 – clumsy in places and lacking cohesion, Momentum is on firmer ground when it lets Kurylenko and Purefoy play cat-and-mouse amidst all the violence, and said violence is taking up much of the running time; a guilty pleasure perhaps, but one that at least knows where its faults lie, and which doesn’t worry too much about them. Hannah Lee Baker (Breslin) and her sister Amber (Vega) live in a small Southern town. Both their parents are dead and they live with their uncle Donny (Temple). Hannah is something of a chess prodigy and views the world around her in terms of a tournament match, with the pieces on the board representing the people she interacts with. The king is her uncle Frank (Bean), the local crime boss. After receiving a threatening visit from the FBI about Frank, she hatches a plan to leave town and take her sister and Donny with her. She approaches Frank and asks for a job making drug deliveries at $20 a time. He agrees to the job but gives her only $10 a time. Picking up the drugs from the trailer where Donny cooks it, her first delivery is to biker Bill Owens (Purefoy), a meth dealer who acts as Frank’s distributor; unknown to Hannah, Bill has begun seeing Amber. When some of the drugs Bill has been distributing prove to be cut with vitamins, he tells Frank about it and asks for compensation. When Frank refuses to pay, an argument breaks out between Bill’s buddy Jackson (Quigley) and Frank’s brother Bobby (Busey). Bobby is keen to hit back at Bill and Jackson for their being disrespectful but Frank needs Bill to continue distributing his meth. Nevertheless, Bobby kills Jackson and another of Bill’s associates, but Bill doesn’t retaliate. He tells Hannah (who he’s now befriended) that he doesn’t want a war. He’s also fallen in love with Amber and doesn’t want to jeopardise his relationship with her. Meanwhile, Hannah is trying to convince Donny to leave with her and Amber but he’s too afraid of what Frank will do if he does; he’s also addicted to the product he makes. Things are brought to a head when Bobby, who has a crush on Amber, sees her with Bill. One night he goes to collect her at Frank’s request but she refuses to go. When he grabs her she fights back but Bobby overpowers her and beats her half to death before dumping her body outside town. When she wakes up in the hospital, Bobby pays her a visit and threatens to hurt Hannah if Amber says anything. But Hannah guesses the truth and seeks Bill’s help. He refuses though, leaving Hannah to seek revenge on her own, and set in motion a series of events that will either see her plan come to fruition, or find her dead at the hands of her uncle Frank. 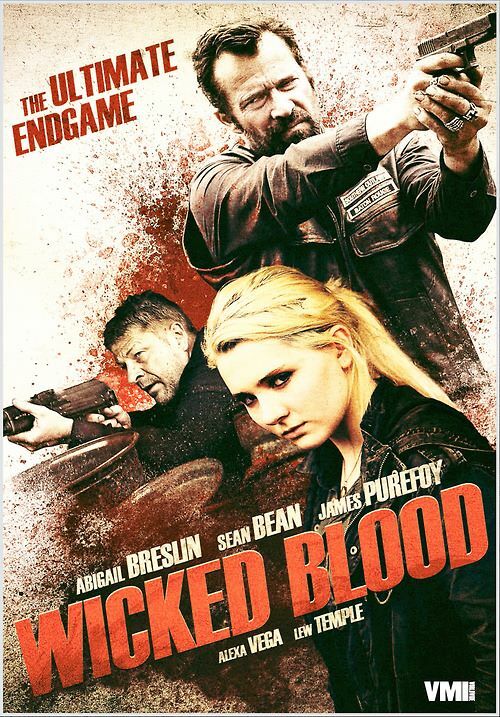 From its low-key opening, with Hannah playing chess against a little boy, to its downbeat ending at the trailer, Wicked Blood is a crime drama that aspires to be something more than just another tale of one person’s determination to break free from hometown ties. Hannah’s need to escape is highlighted by her serious demeanour: she finds it difficult to find any amusement in life, brushing off the attentions of a skateboarder with undisguised disdain, and being told by Donny that she doesn’t smile anymore. She relies on her plan, adapting it when necessary, refusing to let go of it, or come up with another one. The allusion to chess, that it’s not just a game, the same as Life, is firmly made, and Hannah’s focus is unwavering. It all adds up to a character who is entirely believable, despite her teenage years, and Hannah is ably brought to life by Breslin. It’s a strong performance, utterly credible and a clear indication that Breslin isn’t going to be one of those child actors that doesn’t make the transition to adult roles. With such a strong central character it would be natural to expect a slight drop-off in the quality of the remaining individuals the movie is concerned with. But thanks to the quality of the script, courtesy of director Young, this isn’t the case. Frank is presented more as a businessman than a crime boss (though these days the two roles aren’t so dissimilar); for most of the movie he sits in a darkened office poring over balance sheets. It’s a given that he’s a hard man, but it’s a subtler performance from Bean than might be expected, and even when the expected outburst of violence occurs towards the movie’s end, it’s a tribute to Young’s script – and Bean as well – that Frank doesn’t just become a psycho with a gun. Equally memorable is Temple’s performance as drug-addled Donny, a man who recognises the dead end his life has become, and who clings to Hannah’s offer of a new life with a mixture of childish hope and diminished longing. In comparison, Purefoy has the harder task of making Owens’ passivity credible, and it’s not until he makes an unexpected confession to Hannah that his reluctance to engage with Frank is fully understood. It’s a difficult role, and one of the few areas where the script doesn’t entirely convince, but Purefoy is such a good actor that he never quite loses the credibility the character needs. Amber is a secondary character, a little naive but with a good heart even if she and Hannah are at loggerheads like most sisters, and Vega brings a confidence to the role that makes Amber both level-headed and hopelessly romantic at the same time. As Bobby, Busey has the most generic role, that of slow-thinking muscle to Frank’s brains, but imbues the character with a kind of nervous puppy energy that makes Bobby scarily unpredictable. The small-town milieu is well represented by a handful of recurring locations, and there’s an emotive score courtesy of Elia Cmiral. Young shows a liking for low-level camerawork which allows for several shots to stand out in terms of space and composition, and the violence, when it comes, is almost casually brutal yet effective. All in all, Wicked Blood is a well-paced drama whose only drawbacks are its predictability and its repeated use of chess as a metaphor for life, but thanks to Young’s assured handling of the material as a whole, it remains absorbing and potent throughout. Rating: 7/10 – a well-worn idea given a spirited interpretation by Young, and bolstered by strong turns from its cast, Wicked Blood has a quiet, slow burn intensity that works well; easy to overlook considering how many other low-key crime dramas are out there, but definitely worth a look, and a rewarding one at that. After fighting in the Holy Wars, knight George (Purefoy) returns home to seek a quiet life and settle down on a small parcel of land. To this end he seeks out King Edgar (Callow). 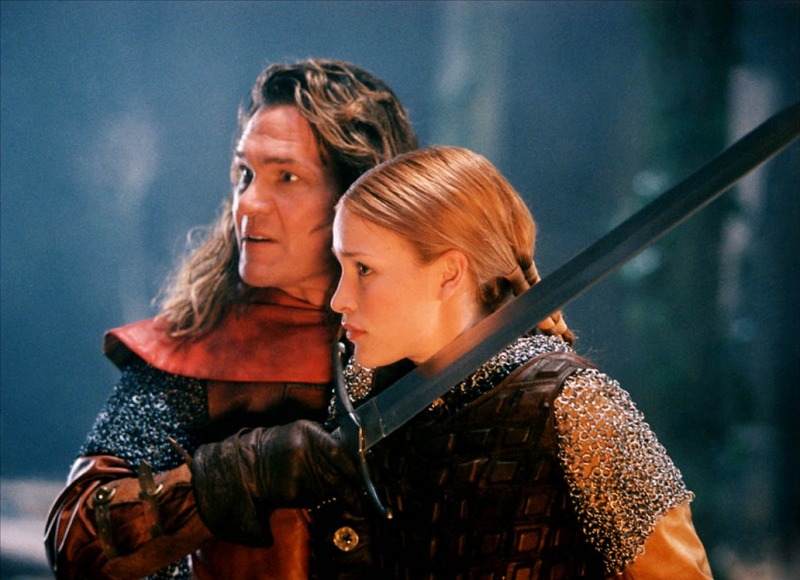 But the King’s daughter, Princess Luna (Perabo) has been abducted, and in return for the land he wishes, George agrees to help search for the Princess alongside her betrothed, Garth (Swayze). While the rescue party, accompanied by faithful retainer Elmendorf (Treacher) and adventure-seeking youngster Wryn (Weeks), look for the Picts they suspect have taken Luna, the truth is far stranger. Luna is actually holed up in a cave looking after a dragon’s egg, having been abducted by the mother (who she calls Adelaide for some reason). Luna is determined that the egg will hatch and when she is rescued by George, she thwarts his repeated attempts to destroy it. An uneasy alliance is formed between them as George agrees to help Luna get the egg out of harm’s way long enough for the baby dragon (who she calls Smite for some reason) to hatch. As they travel they must contend with the machinations of Garth, several bands of Picts, and an approaching band of mercenaries led by the dastardly El Cabillo (an uncredited Val Kilmer) who have heard there is a reward for the Princess’s safe return. Cue sword fights, chases, a comic priest (Castaldi), an easily swayed Mother Superior (Plowright), and a brief appearance by Bill Oddie as an innkeeper, not to mention an adequately rendered dragon and its offspring. 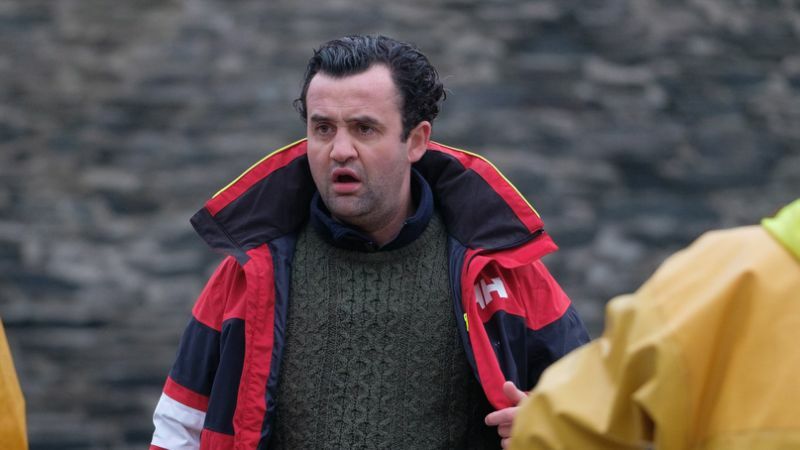 Despite being a Euro-pudding of a movie – Germany, the UK and Luxembourg were all involved in the movie’s production – George and the Dragon is a light-hearted romp that doesn’t take itself too seriously, has a surfeit of knowing performances (Purefoy has the movie’s measure completely), a winning line in obvious, hokey pantomime humour (watch out for the woman fixing her thatched roof when George arrives at the village where his father (Freeman) lives), and a convincing medieval feel courtesy of the (largely) Scottish locations. 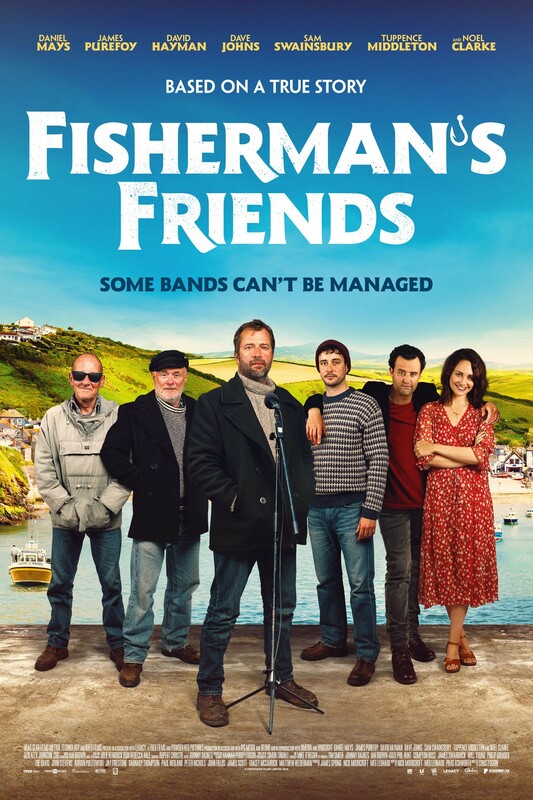 Enjoying themselves as much as Purefoy, the rest of the cast give their all, and the script by director Reeve and Michael Burks is geared to provide each character with enough screen time to shine in their own right, as well as entertain the audience. There’s nothing new here, obviously, but it doesn’t matter. It’s a simple tale simply told but with enough verve and skill to offset its modest budget. Reeve, better known as a producer, keeps the various plot strands and storylines clearly outlined, and frees his cast to inject the kind of earnest frivolity this kind of movie thrives on. The photography by Joost van Starrenburg shows off Scotland and Luxembourg’s scenery to great effect, and the physical and special effects are integrated seamlessly (well, except for the shot of the dragons splashing about in a lake). On the minus side, Perabo’s allowed too many modern day inflections and references in her performance, and Swayze looks ill throughout; his wig doesn’t help either. And that’s about it. Nitpickers may find other things to complain about but that would be doing the movie a major disservice. 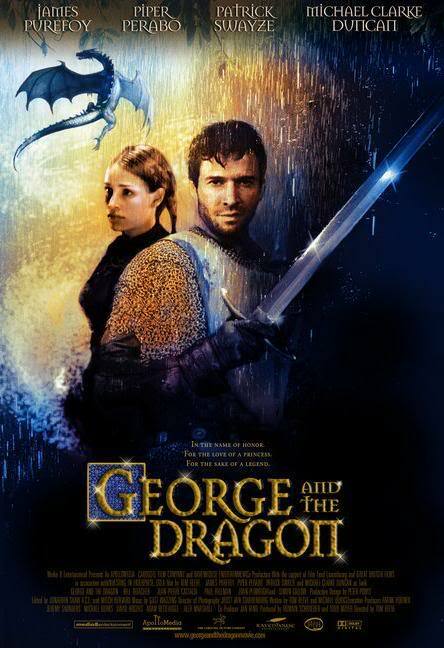 It’s not the best movie ever made but George and the Dragon is fun, entertaining, and a more than pleasant way to spend ninety minutes. Rating: 7/10 – an entirely enjoyable surprise of a movie that’s much better than it looks; for once, a “guilty pleasure” you can tell all your friends about.